“Next, to Iraq. This is a major anniversary there. It was four years ago today that Saddam Hussein's statue came down in Baghdad's Fardus Square. There were many in the streets that day. There were many in the streets today. But for a different reason. 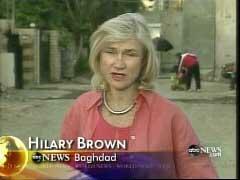 ABC's Hilary Brown is in Baghdad." Hilary Brown: "Tens of thousands of protesters converged on the holy city of Najaf in a sea of Iraqi flags to demand an immediate end to the U.S. occupation. A cleric on stage shouted, 'Get out, get out, occupier!' as the mainly Shiite crowd roared in assent. The protest was ordered by the powerful Shiite leader Moqtada al-Sadr, believed by U.S. officials to be in Iran. But in a statement, he called on Iraqis to stop fighting each other and unite against American troops. Authorities imposed a ban on cars, trucks, even motorcycles, in both Baghdad and Najaf. The fear was that the rally could become a target for bombers. The 24-hour traffic ban before and after the demonstration seems to have worked. “There was little violence today. And that is rare in a country where ordinary people are being shot or blown up at the rate of 100 a day. The appalling bloodshed has turned most Iraqis -- 78 percent -- against the occupation. Thirty-six percent now say that life is worse than it ever was under the dictator. 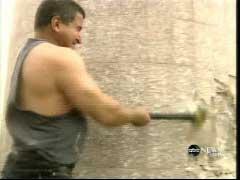 “One Iraqi in particular remembers, and now regrets, that iconic moment four years ago when the huge statute of Saddam Hussein was toppled in Fardus Square. Khadim Yabani is a former weightlifter whose great strength helped bring the statue down. 'At the time, I was proud,' he says, 'but now I just feel regret because nothing has improved.' That's why he says it would have been better that Saddam had never been overthrown. The U.S. military said today that if Saddam were still in power, a protest like this one would not have been possible. 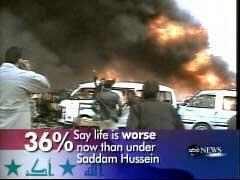 Hilary Brown, ABC News, Baghdad." Just last week, ABC's World News uniquely featured a report from Terry McCarthy on “improvements” in security and living conditions for the people of Iraq. Brad Wilmouth's NewsBusters item on that April 3 story.